When remodeling a kitchen, replacing kitchen cabinets can be a daunting and expensive task. Fortunately, there is a more time- and wallet-friendly method: cabinet refacing. Cabinet refacing, also known as cabinet resurfacing, is the process of transforming the appearance of already existing kitchen cabinets. This can be achieved by replacing or refinishing (painting or staining) the existing cabinet doors, adding new glass inserts, shelves, drawer knobs, handles, or hinges, as well as painting or re-staining the existing cabinet boxes. Though the kitchen layout remains the same, the space takes on an entirely new life and an aesthetic that is personalized and unique. The following basic instructions cover a typical cabinet refacing project, including painting the cabinets, adding glass inserts, glass shelving, and new hardware. Carefully remove the cabinet doors and hardware. Cut out openings in the cabinet doors for the glass inserts. Route out a groove on the back of each door, along the cutout, to receive the glass insert. Clean the cabinet frames and doors with degreaser; over time, finger prints and grease from cooking build up and prevent paint from properly adhering to the cabinet surfaces. Fill any holes from old hardware with stainable wood filler, and allow it to dry completely. Gently sand down any surface that is going to be painted using 100-grit sandpaper. This allows the primer to adhere better. Apply the primer and let it dry completely. Smooth away any brushstrokes in the primer coat using fine 220-grit sandpaper. Thoroughly vacuum and wipe all surfaces to remove any dust or sandpaper residue. Paint all surfaces with an even coat of paint and let them dry completely. Apply a second coat of paint and let it dry. Install the glass inserts. Click here for step-by-step instructions on three easy methods of installing cabinet glass. Install the glass shelves on the existing or new supports inside the cabinet. Install the new cabinet door hardware. Reinstall cabinet doors onto cabinets. Cabinet refacing is a budget-friendly and time-effective alternative to completely gutting your kitchen and having new cabinets installed. Taking into account the costs of having the old cabinets removed, purchasing new units, and installation labor, cabinet replacement can cost upwards of $25,000. In contrast, the cost for cabinet refacing averages $6,700 (Home Advisor), which can include the cost of new cabinet doors, cabinet glass inserts, hardware, pull-down racks, shelves, and even new countertops. With limitless options in paints and stains, door styles, cabinet glass designs, knobs and handles, refacing gives you complete control over your cabinets' new look. The lengthy process of removing and replacing cabinets can render a kitchen unlivable for weeks. Cabinet refacing, however, can be a fun weekend DIY undertaking. Most refacing projects usually require only a few days from start to finish, with minimal disruption of daily life in the kitchen. Since most of the kitchen remains functional during refacing, the process also allows you to work at your own pace. The following case study is based on one of our customer's actual cabinet refacing project. It demonstrates how the use of paint, Bendheim cabinet glass inserts, and new hardware can completely transform and modernize the kitchen. The exteriors of all cabinets and the interiors of the upper cabinets are painted. Glass inserts are added to the upper cabinet doors. Glass shelves are added to a couple of the cabinets. New cabinet pulls and handles are installed. Upper Cabinets - Exterior 29 sq. ft.
Lower Cabinets - Exterior 35 sq. ft.
* Cabinet interiors have more surface area to reface than the exteriors, because the exterior top and back sides of the cabinets are against the wall and ceiling, and do not need to be refaced; whereas the interior top, back, and sides are visible. Accurate measurements are needed for the glass inserts and shelves. In our example, the cabinet glass door inserts are 15" x 23", and the shelves are 18" x 16". ** The cabinet glass door inserts are laminated for increased safety around children and pets. For the shelving, safety tempered glass is used for its increased strength and ability to carry greater loads. Glass price is calculated using the approximate median price of all Bendheim cabinet glass varieties. For precise pricing, please browse our decorative glass varieties for Cabinet Glass and Shelving, respectively. Note the approximate cost of our refacing project came to $1,740, far less than the thousands of dollars needed for a total kitchen remodel. For traditional and period style kitchens, try mouth-blown glass. Our mouth-blown glass is handcrafted in Bavaria in accordance with centuries of European glassmaking tradition. Doors compose the face of cabinets, and have great visual impact. Purchasing new cabinet doors is an easy way to reface cabinets, but it's not the most economical choice. New cabinet doors typically cost between $30 and $60 each, which can add up quickly. DIYers may be more inclined to customize the existing doors instead. A simple, but powerful, change can be achieved by repainting or re-staining the doors and adding new hardware and glass inserts. Translucent, semi-opaque, and opaque glass varieties elegantly hide cabinet clutter. They are the perfect blend of privacy and style. Adding decorative glass inserts to cabinet doors is an option that provides maximum impact with minimum effort. Glass is a timeless and elegant material that can transform the appearance of the entire kitchen, accentuate its style, and make a personal design statement. A variety of decorative glass types, including mouth-blown, patterned, etched, and colored glass, provide virtually endless creative options. The various glass textures, etched patterns, finishes, and colors offer different levels of transparency, making some more obscuring than others. More transparent glass varieties are perfect to show off fine china and collectibles, while translucent and opaque glass types are great for obscuring clutter without the boxed-in look of solid cabinet doors. Cabinet glass, including all Bendheim glass varieties, is available in pet- and child-friendly safety form: tempered or laminated. Safety glass should be used in all applications where extra care, security, or strength is desired, including bottom cabinets and glass shelves. Click here to learn more about safety glass. A common example of laminated glass is a car windshield. Laminated glass is a combination of two or more glass pieces held together by one or more interlayers of a clear plastic (PVB, EVA) or resin. 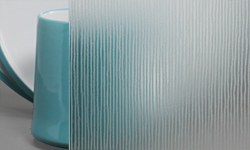 Lamination has little to no effect on the appearance of the glass. However, when laminated glass breaks, the interlayer holds the glass fragments together, greatly reducing the likelihood of a serious cut. Laminated safety glass offers superior safety, security, and sound transmission control. A common example of tempered glass is the side window in a car. Tempered safety glass begins as standard (non-safety) glass, which is transferred to a tempering furnace and heated to a precise softening point, then quickly air-jet cooled. The process makes the glass approximately four times stronger, without altering its appearance. 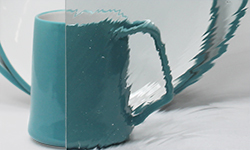 Once tempered, glass cannot be modified - cut, polished or drilled - because it will shatter. While the surfaces of tempered glass are very strong, the edges are more fragile. When tempered glass breaks, it shatters into many small fragments, greatly reducing the likelihood of a serious cut. It is used when safety, strength, and resistance to temperature fluctuations (i.e. in proximity to a strong heat source) are important considerations.